All eyes will be on the Cook Islands when four determined rivals put everything on the line to grab the two remaining qualifying places on offer for the 2019 OFC Champions League Group Stage, as the Qualifier tournament gets underway at the CIFA Academy on Saturday local, (Sunday NZ time). Local favourites Tupapa Maraerenga FC will host American Samoa’s Pago Youth, Samoan champions Kiwi FC and Tongan representatives Lotoha’apai United FC in a keenly contested competition to decide which two sides will join the 14 already qualified teams in the main draw for the region’s premier club football competition. Pago Youth and Lotoha’apai United will be both aiming to create history by becoming the first clubs from their countries to secure qualification for next stage of the OFC Champions League when they kick off proceedings on the opening match day. Patriotic pride could be a unifying and motivating force for both of these sides which arrived in Rarotonga without a foreign import in their squad. These two teams are no strangers to each other after they were forced to settle for a hard-fought draw between them last year. But Pago Youth coach Rambo Tapui believes the American Samoans have found the key to success against their Tongan opponent. “We will take physical approach against our opponents in the first match as we are aware of their strength. 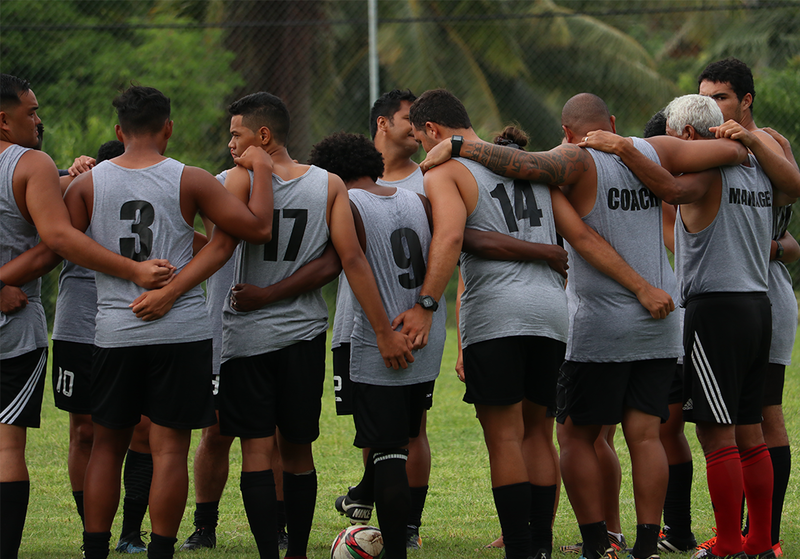 “I think we have players now who can score goals as that had been our weakness in the past,” the Pago Youth coach said. Following two months of preparations Lotaha’apai coach Lui Muavesi says his players can’t wait to line up in the opener. “It is after six years we are appearing back in the tournament and we aim to be the best as we know,” Muavesi said. Acutely aware of the importance of starting the tournament strongly, the Tongan champions will be determined to win. “The first match is like a final to us and we are taking it very seriously to register our first three points,” the native Fijian added. Hometown expectations will be high when Tupapa Maraerenga FC face fierce rivals Kiwi FC in the second game on the opening day. These two sides last met in 2016 in the same competition and the same venue with Kiwi FC edging past their hosts 2-1. Tupapa Maraerenga coach Delaney Yaqona is hoping this time around his players will be better equipped to handle the pressure placed on them as the host team. “It’s always additional pressure performing at home and in recent history we hosted the tournament at home and we went in a favourable position by winning the first match and then lost in second match and finished second. “That was really disappointing but we know the expectation of everyone this time around and this is something we have prepared much better this time,” he insisted. Yaqona is also adamant his side is well aware of the threat posed by their Samoan opponent. “It’s a big game on Saturday and Kiwi FC is our biggest rival traditionally in this tournament. “We have met so many times in the qualifiers and we understand they are much stronger side this year with some of their imports,” he added. His counterpart Martin Tamasese is also expecting a tough encounter. “We played Tupapa side three years ago and I know they are good team and also prepared well for the tournament. “It a big challenge for us to play the host team in our opening match because first match is always tough but we have our plans to face them up,” said the former Samoan national representative.